Ubisoft has had a heck of a year when it comes to releasing open-world games. From Watch Dogs, to Far Cry 4, to Assassin's Creed Unity and Rogue, the publisher seems very keen on creating open-ended environments of all sizes and styles in order to draw players in. It's an impressive achievement, as all of these worlds offered worthwhile exploration and enjoyable sandbox play. The Crew, however, has the most impressive open world setting in any game this year. Unfortunately, it has little else going for it. 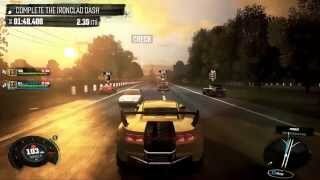 The Crew is a multiplayer-focused racing game that takes place in a virtual version of the United States. You are Alex Taylor, a man that's pretty good at driving cars. Your brother is involved with a gang known as 510s, and it's not long before he is shot and you are framed for the murder. After years in jail, an FBI agent offers you a way out – help bring down a corrupt FBI head honcho, and get revenge for your brother's murder at the same time. From that point, you rise through the ranks of the 510s by racing and completing various missions for both the FBI and the members of the gang. This all sounds fairly generic. And that's not a big problem – after all, this is a racing game, and players are hardly looking for grade-A storytelling. But The Crew takes its narrative way too seriously, and suffers for it. First of all, in a game described as an MMO, why have pre-defined characters at all? Aren't the players supposed to feel like they are unique in the game world? When you know there are thousands of Alex's driving around, the plot loses whatever small impact it had. But the ultimate downfall here is the absolutely awful dialog. The writing and voice actingsurpass the "it's so bad, it's kind of good" territory, producing one-liners and conversations that frequently induce involuntary laughter. But then you recall that this is a fully priced retail title from a recognized publisher, and the absolutely terrible quality of the story and dialog stops being funny. Oh, and Alex is voiced by Troy Baker, in what is easily his most "just doing it for the paycheck, and I can't believe someone actually wrote this" role of the year. But let's talk about some positives. As hinted at earlier, The Crew offers the best open world seen in any game this year. The version of United States that players can drive through and explore is absolutely huge, and it takes hours to drive across the perimeter of the map. Fans of the Test Drive Unlimited franchise will be extremely pleased. There are a few major cities and smaller towns recreated in the game, from New York and Miami to Los Angeles and Detroit. These cities are of course miniature versions of their real-life counterparts, however it must be said that the developers have somehow managed to perfectly recreate their subtleties. Driving through a city, you'll come across famous landmarks, and also various neighborhoods that are instantly recognizable by their building architecture. From Little Haiti in Miami to the Bronx in New York, the game does an excellent job of squeezing in these details without building a full scale model of the city. This attention to detail continues as you venture out into the rural areas. From the farmlands in the East to the deserts of the West Coast and the swamps in the South, The Crew offers glimpses of almost every type of environment that can be found across the US, managing to create a surprisingly strong sense of atmosphere and a feel of an actual cross-country road trip. Throw in a full day and night cycle, and The Crew is truly an immersive experience that should be commended for its recreation of the whole country. Exploring this vast world is interesting, but you probably wouldn't want to drive the whole way. To help with that, the game offers fast travel to any area that you've previously visited, and also a transportation system. So players can take a train or plane ride from New York to LA and start exploring there – even if they've never been to LA before. It’s a great way to add to the feeling of vast open space, without needlessly forcing lengthy roads trips through the country just to get to the next destination. 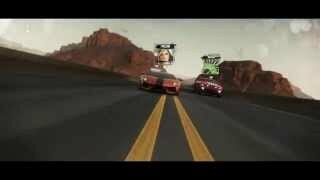 The Crew is the first release from development studio Ivory Tower, which includes ex-staff from Eden Games (TDU), as well as additional assistance from Ubisoft Reflections (Driver: San Francisco). Given such credentials, you'd expect a solid driving experience, and that's mostly true. 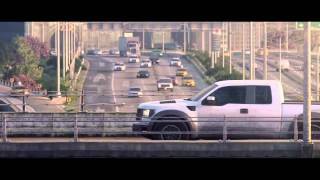 The handling model in The Crew is slanted towards the arcade rather than simulation, with cars able to stop very quickly and turn sharply, yet lacking precision at high speeds. Drifting is immensely satisfying. The handling also changes as you upgrade your cars with parts, and also depending on which of the 5 specs you're currently outfitted with. This isn't a car-collecting game like most racing titles these days. There are only about 40 vehicles, but the range is fairly decent, from Ferrari and Lamborghini to Ford and Nissan. Instead, each car can participate in a number of the five specs – Street, Dirt, Raid, Performance, and Circuit. Only about 4 or 5 cars can be outfitted to participate in all 5 specs – the rest are usually limited to two or three. Indeed, it wouldn't make sense to outfit an Aston Martin for Dirt racing. With that in mind, The Crew can be easily completed with just the first car you choose for free in the beginning of the game, because you only need to buy new cars if you want to excel at a specific discipline. This lack of variety may disappoint fans of collecting rides; spending money on new cars seems counter-productive, at least until you've finished the main story and can pull in decent income from end-game missions. But at the same time, The Crew manages to provide a number of different racing disciplines to appeal to a broader audience. There are two types of currency in the game – Bucks and Crew Credits. These are used to buy new cars, or visually customize your existing ones. But you can't actually use either to perform mechanical upgrades. Instead, new car parts only come from main missions and Skill minigames. Skills are littered throughout the game world and offer quick and seamless challenges to the player, all you need to do is drive through the starting point to trigger them. Climbs, escaping or following AI, jumps, scramble, slalom, and speed are the objectives. Depending on how well you do, the game awards either a basic part, or a Silver/Gold tier part that not only improves the performance of its main component, but also gives an extra boost to another stat. So for example, you could earn a weight reduction upgrade (bronze level), or a silver/gold weight reduction upgrade that also boosts your top speed or acceleration. Players can see what rewards they will receive from each Skill by simply using the main world map, so once you're done simply enjoying the seamless minigames, you can scroll around and find the Skill challenge that has the part you need. Finishing a Skill and earning a performance part unlocks it for purchase for your other cars. There's a somewhat arbitrary car performance level that ranges from 1 to 1299, and a more classic driver profile level from 1 to 50. You usually get experience points to level up from most events, and gaining new levels earns perk points; these are then spent into a number of passive boosts, such as increased income, reduced repair and car costs, and even increased map reveal radius during exploration. It's standard RPG-like design, but is decently enticing. The Crew is ranked #1329 out of 1435 total reviewed games. It is ranked #135 out of 152 games reviewed in 2014.